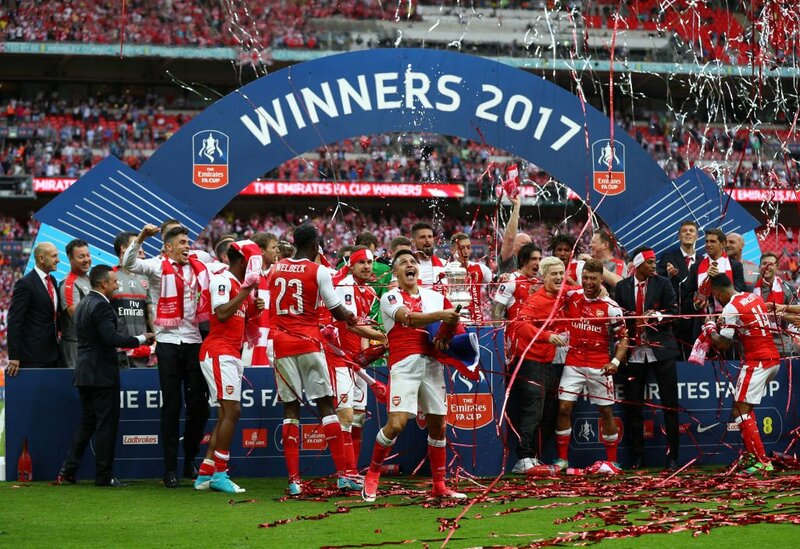 Arsenal defeated Chelsea 2-1 in the 2017 FA Cup final at Wembley to become the most most successful team in the competition with 13 trophies. 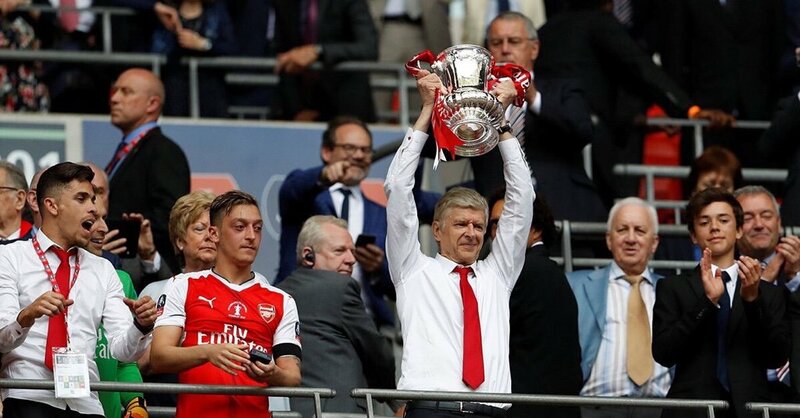 Arsene Wenger became the most successful manager in the FA Cup with 7 trophies – more than any manager. With an injury hit back line, Arsenal started the final as the better team with beautiful sets of passes that would make any neutral applaud in admiration. The Gunners were hungrier and had Chelsea’s defence in disarray. It was only a matter of time before the Gunners took the lead. Sanchez reacted quickest towards an aerial loose ball, got into a scoring position and sent the ball past Courtios. His celebrations were paused after the assistant referee signalled for an offside offense. The referee engaged his assistant to clarify that although Ramsey was in an offside position, he made no contacts with the ball. Although the ball hit the arm of Sanchez, the goal stood. 1-0 to Arsenal. It could have been 3-0 by half time but Cahill cleared Ozil’s attempt off the line. The woodwork denied Welbeck from a header and Ramsey from close range. Cahill also denied Welbeck from getting his name on the scoresheet. At the back Metersacker was having a great game and Holding was having a war with Diego Costa. The young English defender was a delight to watch and stood his ground against the striker. Then came the fugacity of notable events. After a torrid time playing second best to Oxlade-Chamberlain, Victor Moses longed for an early shower. He came to the shores of Jordan, felt the heat of the Ox, took a great dive Michael Phelps would be proud of, with the hope of reaching the promised land by hook or crook. His hook caught the black fish who was pleased to unleash a yellow bite which drew red. He had the shower he longed for. The red card made Arsenal relax and they were punished in the 76th minute. Costa beat Holding in the box before equalizing for the Blues. Ospina had a touch but it was not enough. 1-1. Wenger reacted immediately. In came Giroud in replacement for Welbeck. 29 seconds after the restart, Arsenal were in front again. Girouf slipped in behind the Chelsea back line, crossed the ball back towards goal with his first touch of the game for Aaron Ramsey to nod in. 2-1 to Arsenal. The Gunners held on to their 6th trophy in 4 years and were expectedly delighted after the final whistle. The disappointment of missing the Champions League places have been washed away by the FA Cup trophy – a third in four years. It was double delight for me seeing Tomas Rosicky at the stadium. How much I love Rosicky. Arsenal is a great family. Wenger made it so. His future and that of Alexis and Ozil is next. Rejoice, Arsenal have not gone trophyless in four consecutive years. It is always good to play your last game of the season and go home with a trophy. Time to watch the highlights again. Has anyone seen Kante, Hazard, Fabregas, Matic and Pedro? Congratulations to Iwobi. My Nigerian brother. Previous Previous post: Arsenal: Hello Europa!